What does the perfect oasis of a living room look like? Ceiling fans probably aren’t at the top of your list when designing all the furniture and accessories for your space. But perhaps they should be. Ceiling fans have gotten a bad rap over the years, however with styles getting sleeker and more stylish, the options are starting to broaden. Our favorite of the moment? White ceiling fans. Stylish white ceiling fans can disappear into crisp white ceilings, but add that little bit of natural air flow that will make your space feel complete. 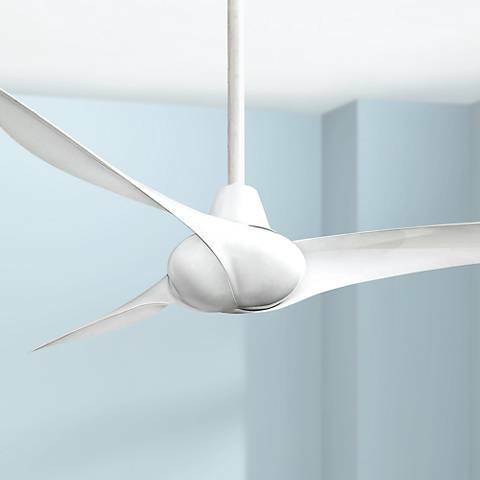 If you have a white ceiling, try install a matching white ceiling fan for a natural complementary effect. Painting the ceiling a pure white that perfectly matches the fan will have this disappearing effect that totally works for the space. When you have a high vaulted ceiling, it only makes sense to include a ceiling fan. The ceiling fan circulates the air way up there, creating a slow breeze to move stale air and give the room a fresh feel. Another way to accent pitched ceilings with beams is to place a ceiling fan directly on the center of the beam. It is a cost-effective installation and again totally disappears into the ceiling. A beautiful ceiling fan, or pair of ceiling fans, is the perfect way to cool down on those extra hot days and bring in the crisp night air.